This is the third installment in a multi-part series narrating Beirutista's upbringing abroad and her wrestling between different cultures. At UC Irvine, I was vigilant for any scent of Lebanese life. I scouted Ring Road, the campus perimeter, during club week and discovered the Lebanese Social Club as well as the Society of Arab Students, both of which I quickly signed up for. 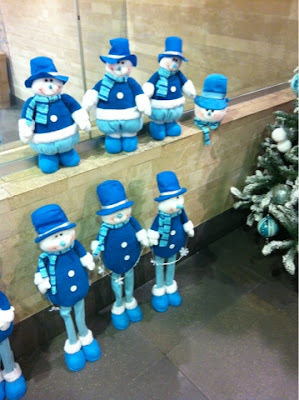 They're called snowmen for a reason. Personally, the snowhead resting on the ledge strikes me as eerie. 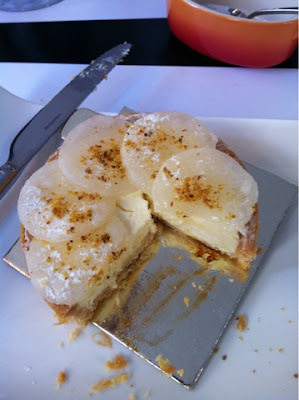 I confess: Gustav's pastries are decadent. The Hamra patisserie has catapulted into fame for its red velvet cake balls, and it's no wonder because the small spherical bites pack a dense, doughy richness that can't be found anywhere else in Lebanon. 3,500LL ($2.33) seems a bit steep for something so small, but Gustav can get away with it--it's a monopoly, after all. But when a chain coffee shop just a few blocks down from the distributor charges 8,000LL ($5.33) per ball, that's a criminal offense. Second Cup features a selection of cakes, viennoiseries, and muffins in addition to its specialty coffees. Half of those pastries come from Gustav, and what drove me wild last week as I sat inside Second Cup watching customer after customer fork over one form of dough for another was the cafe's selling strategy. Brilliant but felonious. Lebanon's wet season is well underway, and it hasn't been merciful. 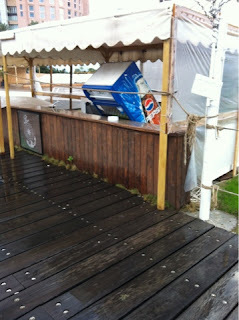 Gusty winds knocked over this soda cooler down by St. Georges Bay. My last week in the US was celebrated with a Carnival cruise to Avalon and Ensenada, in Baja California. Days were spent lounging, sunbathing, and eyeing the extensive buffet with temptation and angst; nights were filled with comedy shows, Las Vegas style performances, and fancy four-course meals. But this trip brought me to one startling realization: how fat America has become. If you ever want to fully understand the meaning of "morbidly obese," board one of these ships and see for yourself. I'd venture to say that a good three-fourths of the passengers were easily overweight, and to my surprise and grief, they exercised no restraint at mealtimes (and every minute in between). One main dish at dinner simply wasn't enough; they required multiple to be satiated. Food was available around the clock: the pizza parlor and frozen yogurt bar never shut down. Lunch could be had as soon as 11 am and lasted so long, it ran into dinner. It has been two years since I set foot in the US, and I must confess, either a lot has changed or my tolerance has waned in the interim. I hadn't been back to Boston since I graduated in June 2009. I'd always smiled upon my memories of the city, as it marked my first brush with urban life, a taste of Europe in America, and the appreciation of four distinct seasons. As a student, I hadn't had the time to indulge in Boston's food scene, so coming back, I had a few items on my list that I was keen on trying. John Paul, my brother, also added his contributions to my local food tour, and in all it was a happy medley of comfort food. 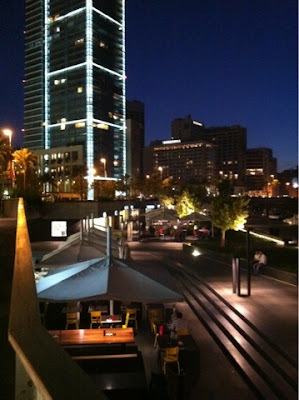 It's been 22 months since I arrived to Beirut, earnest, energetic, and overflowing with optimism. On a mission, I'd been dispatched by MIT to recruit the region's finest, but in so doing, I myself was recruited for a job in strategy management at a leading local bank. I've finally accumulated enough vacation days to go "home," to my country of birth, to my childhood house, to the world I first awoke to. Riverside County is stop #1, where I'll linger a little less than a week before I fly east to Boston to visit my younger brother at Tufts. Boston is my second home: I spent a good two years there pursuing my graduate degree, academic glory, and New England's finest: clam chowder. 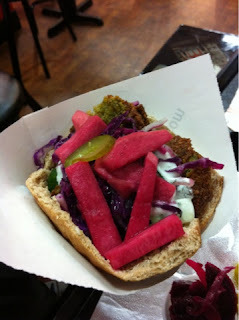 I can't wait to be back: I've already devised a plan of alimentary adventures! And the silicon valleys of the West. Music of the Beirut breeze. Alas, cannot take care of what they love. I like peanut butter with pita bread. I vow to continue the adventure, be it sweet or bittersweet! Thank you, dear readers, for your love, support, and loyalty. It is an honor serving you. 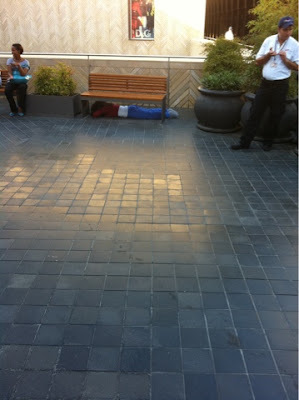 What's the story behind the dummy lying face down beneath a bench in Beirut Souks? At first I thought she was a human making a statement of some sort, as even up close, the body seems real. But yesterday, as I stopped to study the spectacle after work, a fellow bystander explained she was just a dummy, and noticing my disbelief, he walked up to her and nudged her with his foot. The body easily gave. Bizarre and creepy. What's the scoop? Saturday night we headed over to Latest Version Diner (LVD), pumped up in anticipation for their premium burgers. Anytime a restaurant has to remind you that their fare is "premium," you can bank on the fact that it won't be. If you're a leader, do you have to spew it to the world? Certainly not. But we ignored the obvious, because we were desperate for a real burger in a country where the frankfurter is deemed bliss in a bun. The roasted shelled peanuts offered upon our arrival were promising. Even the napkin that was covered with print descriptions of Angus versus Wagyu, marbled meat, and the merits of each was enlightening. But the rapture ended there. 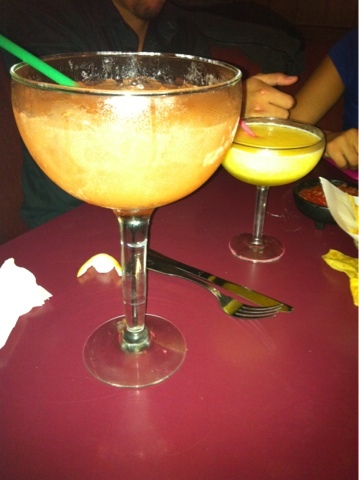 We ordered 6oz. Angus beef burgers, expressly asking for no mayonnaise on any, along with sides of potato wedges and a green salad. The waiter tried to convince us that the wedges would be divinity incarnate if topped with chili con carne, but we politely declined. 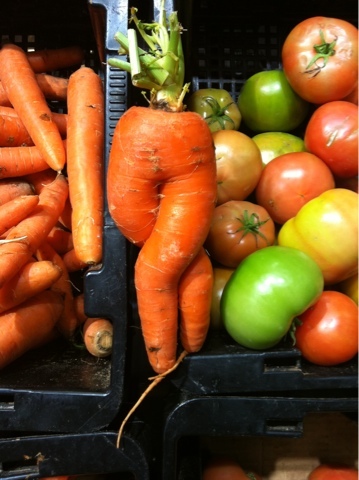 A burger without the frills, please. 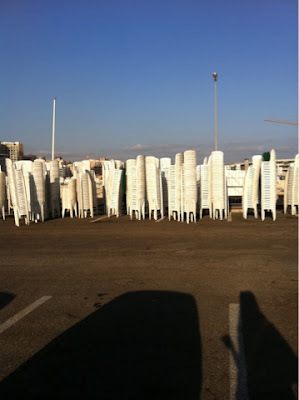 In the wake of Pope Benedict VI's visit this past weekend to Lebanon and the massive open-air mass held at the Biel seaside, thousands of chairs--stacked or sprawled about--continue to adorn the Beirut skyline. A reported 350,000 spectators made it out on Sunday to the Pope's special service. Dining out has never been so popular in Lebanon as it is today. New restaurants open every week, striving to differentiate their service or cuisine with a unique flair (does "Lebanese with a twist" ring a bell?). But with competition so fierce, many are finding themselves in the red, unable to make ends meet, and they're closing their doors to diners. I used to think basic pricing strategies were common sense. For example, if there are multiple sizes of a particular product, say 100g and 200g of Haribo Happy Cola candy, you'd expect the 200g bag to cost relatively less than the 100g bag. First, companies like to reward customers who shop big, hence the slight discount for the larger product; and second, convenience costs money. A small bag is more desirable to an individual shopper, so pricing it at a premium is an infallible tactic retailers use to make an easy penny. This was not the case at TSC Signature store in the downtown Beirut Souks, where I found myself yesterday afternoon wiling away in the candy aisle. 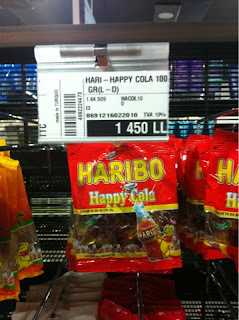 The 100g bag of Haribo Happy Cola is priced at 1,450LL ($0.97), whereas double the size will set you back 3,150LL ($2.10). It may be a mere 16-cent mark up, but I think they meant to reverse the sign: -0.16, not +0.16. Go figure. 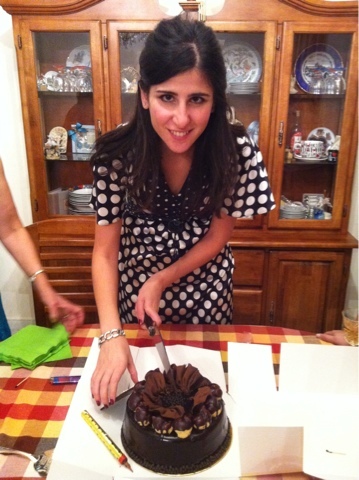 A couple weeks ago, we trekked up to the mountains of Faraya to seek escape from the intense heat plaguing Beirut. The climate is remarkably cooler, and the clean, pristine air revitalizing. We made our way to Faqra, a beautiful resort village studded with mansions, gated communities, a golf course, and ski slopes. We arrived to the hustle and bustle of a street circus that had drawn out throngs of kids and their parents. But these weren't village kids per se. These were the privileged children of wealthy families who own swanky villas in Faqra and vacation there exclusively in the summer and winter. They sport fashionable wear, wile their summers in day camp, and are vigilantly tended to by live-in maids. In fact, many families have more than one maid, depending on the number of kids they have in tote. None of us crave moving on. There's comfort in the familiar, a natural inclination to plod along with the status quo. We've all found ourselves in that situation, the anxiety we felt when we plunged into a new reality. The embellished memories of the past we created with our rosy-tinted glasses. The longing to go back to what once was, even when we knew full well that it would never quite be as we remember it. After finishing my one-year MBA in Paris, I moved to Abu Dhabi to begin work as a strategic consultant. I caught myself daydreaming constantly about my time in the City of Lights, replaying memorable occasions over and over in my head. I would log on to Facebook and Skype to strike up conversations with old classmates and peers. I even spent hours poring over job listings in Paris, hoping to find an impossible fit for a heavy-tongued French speaker and foreigner like myself. LivingSocial is pulling out of the Middle East, citing unprofitable operations. The daily deals company, a giant in the US, faces stiff competition in the UAE, Egypt, and Lebanon from copycat groups who are undercutting one another to win merchants' business. Move over Pinkberry, there's a bigger thief in town! Yogen Fruz, a do-it-yourself frozen yogurt bar, recently opened inside the new Le Mall Dbayeh, and they're charging an arm and a leg for their frosty treats. Upon entering, you are greeted by a friendly waiter, who ushers you over to the froyo machines, where you can choose amid a vast array of flavors. 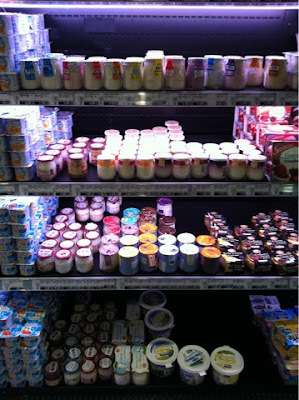 You proceed to the toppings bar, piling on fruits, nuts, granola, and other goodies, before you make it to the cashier. You're so mesmerized and distracted by the opportunity you had to participate in the making of your own bowl that you forgot to glance at the prices--oh, wait, they're not even posted! The cashier smiles at you, utters the words "Pay and Weigh," and places your bowl on a scale. Weight and price suddenly appear, and your heart sinks.